Displacements presents selected works by Berlin-based, American artist Erik Smith that highlight his use of sound and other sculptural means to evoke the atmospherics and dynamics of place. Featured at Errant Sound’s new space is a survey of projects developed over the past several years from various contexts including Berlin, Miami, and most recently Denver, US. Smith’s site-focused practice evolves out of the physical exploring, salvaging and/or excavating of urban contexts and often employs found objects and sound as points of departure for reflecting on the spatial, cultural, and historical dimensions of given locations. Included in the exhibition is a selection of audio and sculptural works from three different projects/contexts focusing on Smith’s interest in transitional sites as agglomerations of competing uses and meanings. His most-recent project Ghosts (2018) revolves around the visual and acoustic trope of the flicker in evoking the precarious status of a gallery building and former 1950s-era auto repair shop located in a long-depressed neighborhood of Denver, CO. For Titanic (2016-), inspired by the salvaging of a wooden shelf from a bunker in Berlin-Mitte, a series of modified turntables creates a dark, acoustic atmosphere that alludes to the site’s eerily associative, contrasting phases: a German theater famed for performances of Jacques Offenbach’s Orpheus in the Underworld in the nineteenth century; a sprawling underground bunker during WW2; and the recently opened 4-star Titanic hotel today. And finally AABBCCDV (2012), which centers on the demolition of an artist-run space in Miami FL, recorded and produced as a 12” record edition and shown together with reconfigured sculpture-artifacts taken from the building prior to its destruction. The exhibition presents the projects not in their entireties, but stages core elements of each alongside one another, thus providing a trans-contextual overview of Smith’s use of sound in relationship to his sculptural aesthetic. The title Displacements refers to the artistic process of disturbing, translating, or abstracting source materials to resonate on symbolic and metaphorical levels, creating in viewers an altered awareness of the underlying conditions that define place. It also alludes to the processes of urban change and redevelopment, where the physical transformation of the built environment entails a shifting or transposition of urban identities. With Smith, sound and sculpture intermix to produce a kind of hybrid atmospheric space for contemplating the complex status of transitional sites characterized by impermanence and slippage. This exhibition is the first in a series of exhibitions presented under the heading Visual Approach to Sound, which aims to reflect on sound from the perspective of visual art. For this series, visual artists are invited to present works that are based on the forms and methods of visual art but which are also defined by a central acoustic aspect. Visual Approach to Sound is conceived and organized by Mario Asef for Errant Sound Berlin. We are very happy to announce our new project space in Rungestraße 20, Berlin-Mitte! It is funded by the Arbeitsraumprogramm (ARP) of the Senate Department for Culture and Europe of Berlin and supported by the Mietergenossenschaft rs20 e.G. The lecture and performances will be followed by a discussion. For celebrating the reopening of Errant Sound in its new space in Rungestraße 20, the performance and sound artists Janine Eisenächer and Steffi Weismann will present their new collaboration READY MAKING #1. Within this artistic research-project, Eisenächer and Weismann invite their guests to collectively reflect upon the relevance of sounds and noises that come into being through sound-based actions (“klangpraktische Handlungen“, Elena Ungeheuer) with objects and materials in performances from the fields of Performance Art, Sound Art, and Experimental Music. Furthermore, they investigate the object-based know-how and auditory knowledge in sound performances: What do we learn and experience from the encounter with everyday objects when playfully exploring their acoustic potential and listening to them? What agency do these things and material sounds entail? How do we perceive time and space while making sounds with objects? After their first variation of this project, which both artists realised under the title READYMADE GRÜÜSCHSCHSCH ——- at Gallery TART in Zurich in the beginning of this year, they now turn the new space of Errant Sound into a listening space. Visitors are invited to playfully explore and performatively interact with diverse objects based on specific instructions for making actions and listening to them. In their performance during the exhibition opening, Eisenächer and Weismann condense their collected experiences and knowledges with selected materials. In addition to that, a video work will be part of the exhibition that presents excerpts of interviews with Livio Beyeler, Janine Eisenächer, Anja Ibsch, Markus Gössi, Pascale Grau, Irene Maag, Muda Mathis, Barbara Naegelin, Boris Nieslony, Lara Russi, Andrea Saemann and Steffi Weismann, who remember sound-generating actions in performances. READY MAKING #1 focuses on non-amplified sounds and noises that come into being through object-based sonic practices in the field of Performance Art. In the course of further events in this performance and lecture series, amplified sounds and noises as well as sound performances from the fields of Sound Art and Experimental Music will be discussed. We are happy to annonce that – after leaving Kollwitzstr. in December – we got a new home for our project space ! Close to S-Jannowitzbrücke and U-Heinrich-Heinrich-Str. 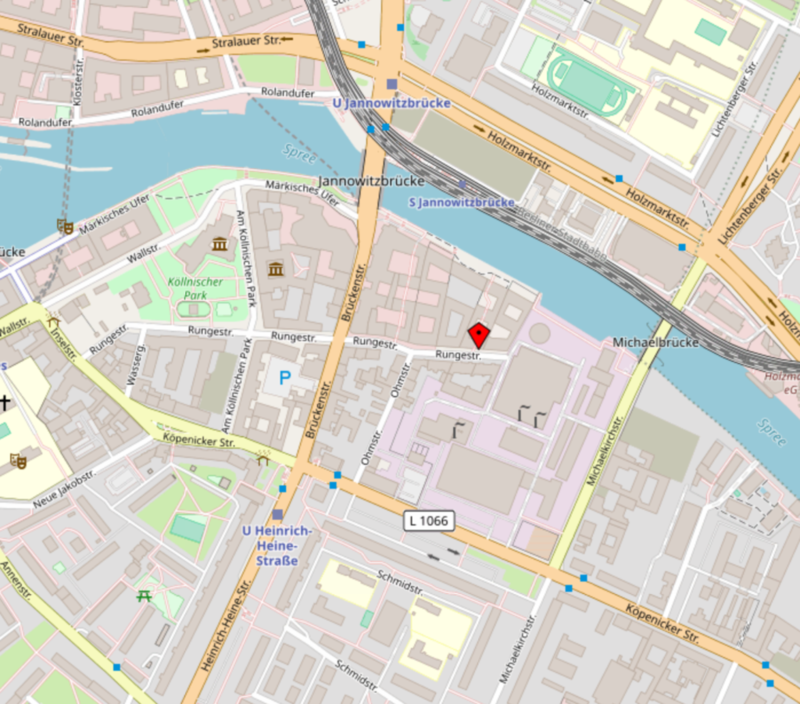 we will have a nice (and bigger) space in the center of Berlin at river Spree (behind TRESOR / EWERK in Köpenicker Str.). The space is permanently supported by the Senat of Berlin (project space program, initiated by ‘Netzwerk freier Berliner Projekträume und -initiativen‘) and Errant Sound was chosen by an international jury among 14 contestants. Der Schlaf ist für den Menschen unverzichtbar und hat im Alltag sowie kulturell für ihn große Bedeutung. In der frühen Kulturgeschichte setzte bereits die intensive Beschäftigung mit Schlafphänomenen ein. Sowohl in der Bildenden Kunst als auch in Musik und Lyrik zeugen zahlreiche künstlerische Arbeiten davon. Unter kulturgeschichtlichem Aspekt wurde der Schlaf zeitweise von der kapitalistischen Gesellschaft abgewertet, da sie ihn als Zeit betrachtete, die für produktive und gewinnbringende Aktionen verloren war. In der Kunst hingegen wurde gerade der Schlaf ebenso wie der Zustand der Muße und des Tagträumens genutzt, um für innere Bilder, Emotionen und Gedankengänge empfänglich zu werden. Schlaflaboren und Apps werden auf neurowissenschaftlicher Basis Körperfunktionen und die Dauer von Schlafphasen gemessen und ausgewertet. 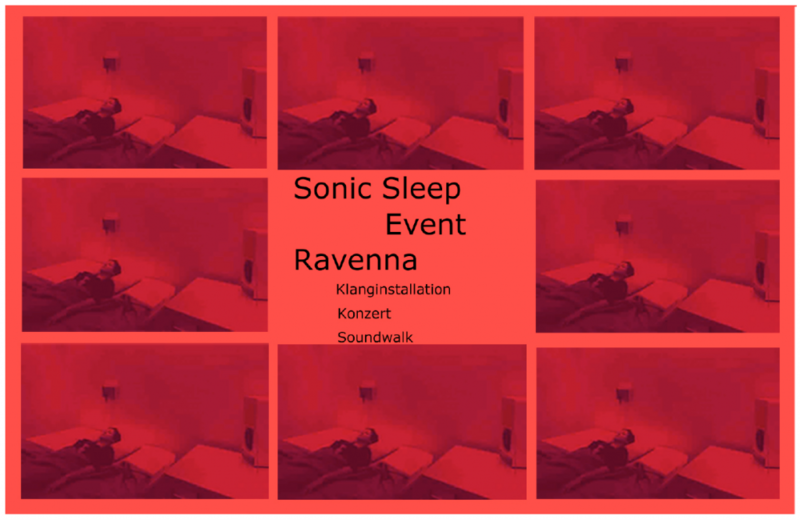 Die Klanginstallation „Les Jours je songe, les nuits je rêve“ von Jutta Ravenna hingegen konzipiert Schlaf als künstlerische Aktion. Sie nimmt dem Schlaf gegenüber eine eigene Position ein, versteht ihn als Reaktion auf das gesellschaftsbedingte Vermeiden von Muße, Tagträumen und Traum und will diesem die verdiente Aufmerksamkeit einräumen. Sound is crucial in the definition of public space today. Through listening, sound stimulates participation in the territories we inhabit. Even if listening is unconscious for many, sound is still affecting our bodies and influencing our experience of a public space. By appearing and occupying unexpectedly a space, sound is able to create one of the temporary autonomous zones that Hakim Bey coined. This way sound appears as a tangible presence in the space that evades the structures as they are usually conceived and contests the temporality and spatiality of the public. In these situations, considering sound beyond hermeneutic listening brings into consideration sound as substance for community and communication. 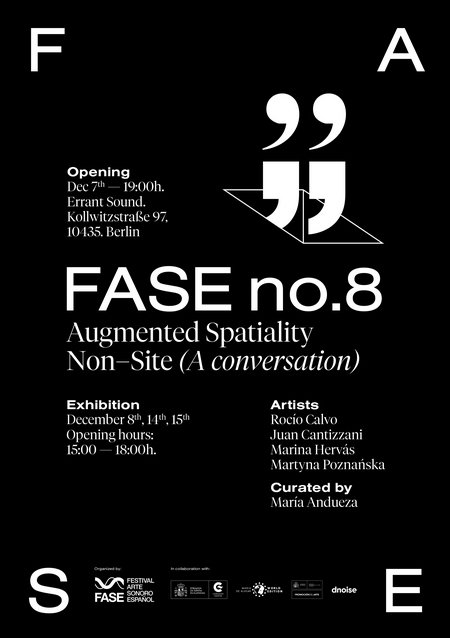 Non-Site (A conversation) is a collective situation dealing with the public space in relation to the exhibition device. During the first week a group made up by Rocío Calvo, Juan Cantizzani, Marina Hervás and Martyna Poznańska will explore the displacement of the concept of “public” in between the gallery of Errant Sound and the territory of Berlin. 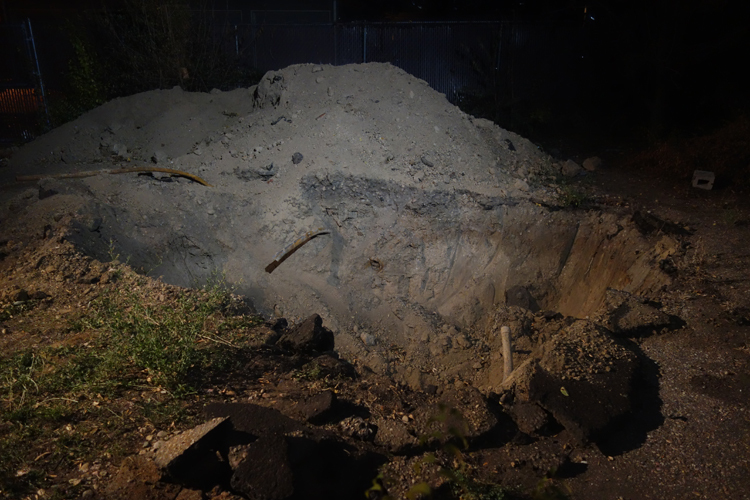 Following the words by Robert Smithson, the proposal is conceived as “a non-trip to a site from a Non-site”. The work-in-progress during the week will consider and jointly explore, through sound interventions and documentation as living matter, the ways of appearing in and occupying out the urban and the exhibition space. Non-Site (A conversation) will be thus built up in the gallery out of the transition from the individual to the common and the round-trip paths between private and public conditions. 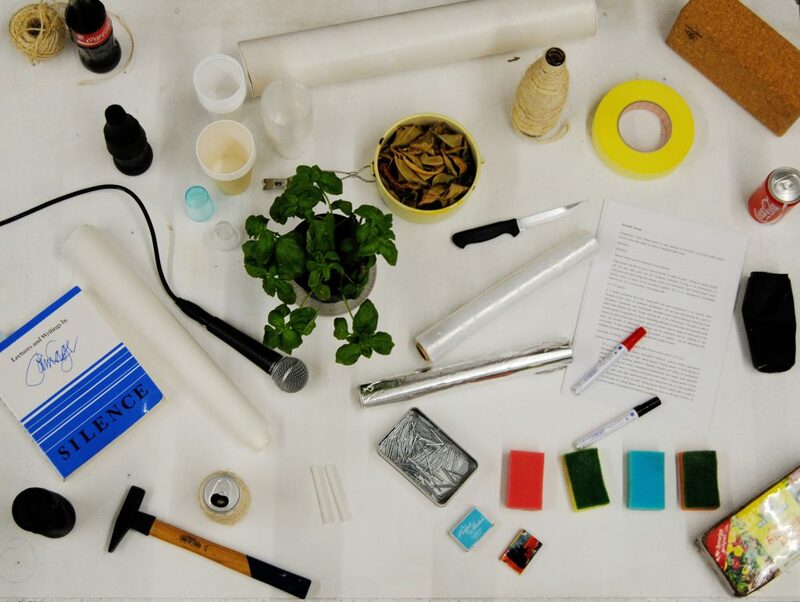 In her new research performance-series Doing sounds with things, Janine Eisenächer explores the possibilities of co-existence and co-creation, of being-with and inter-being with objects and materials through sound and touch. She understands the present materials not as functional objects but as things and matter we live-with, that have their own agency and presence, their specific material qualities, stories and resistances. In Doing sounds with things #1, Eisenächer engages in real encounters, in a care-taking and maybe even conflicting co-llaboration and community-building by carrying out matter-based, sonic-spatial practices with them. In experimentally and playfully creating acoustic „string figures“, with reference to Donna J. Haraway’s book Staying with the Trouble, Eisenächer underlines the generally multi- and inter-sensual and -sensory process of human (inter-)action and perception, including one’s desires and imaginations, and particularly highlights the relevance of sonic-tactile and listening practices, experiences and knowledge in art and everyday life for our world-making and our inter-being and being-with the world. Parts of this lecture and sound performance have been developed together with cultural scientist Michael A. Conrad (University of Zurich) and were presented in the joint lecture Hearing co-existence: On the spatiality of sound and acoustic desires in objective encounters at the conference Sounding out the Space in Dublin, 2017. 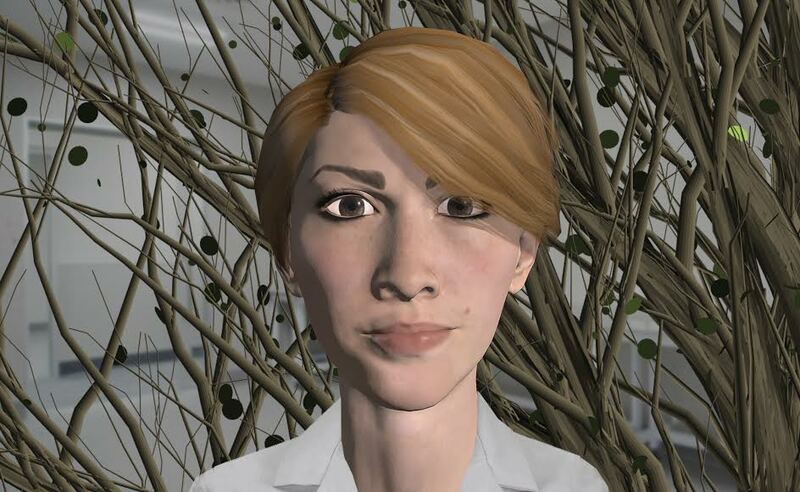 Janine Eisenächer is a performance artist, curator, researcher and writer, based in Berlin. She creates solo and group performances on the subjects of work and collaboration, including related topics such as gender, identity, (post-)colonialism, care and solidarity. Within her performance practice she often works with objects and materials (things), with which she creates sonic spaces through body-generated and material-based sounds, discussing the inter-relations between performer and non-human agents as well as how we perceive and relate to the things that surround us and that we live-with. She presented her works in various Performance Art festivals and events across Europe, in Northern America and Aotearoa New Zealand. In addition to her performance practice, Eisenächer is a part of the artistic-curatorial group Inverse Institution that develops collective practices of institutional critique, and of the political research-group wwwz (wie wollen wir zusammenarbeiten? – how do we want to work together?) with which she researches forms of collaboration in freelance cultural production. She is a board member of the self-organized art space Flutgraben e.V. in Berlin. Eisenächer holds a Magistra Artium degree in Theatre Studies and Comparative Literature (Free University of Berlin) and wrote her thesis on material-based sounds in Performance Art. She currently researches on Performance Art-related sonic and action-based knowledge(s). The essay is the perfect format for a crisis. Its porous and contingent nature forgives a lack of formality, while its neglect of perfection and virtuosity releases the potential for the incomplete and the unrealizable. These seven essays on The Political Possibility of Sound present a perfectly incomplete form for a discussion on the possibility of the political that includes creativity and invention, and articulates a politics that imagines transformation and the desire to embrace a connected and collaborative world. 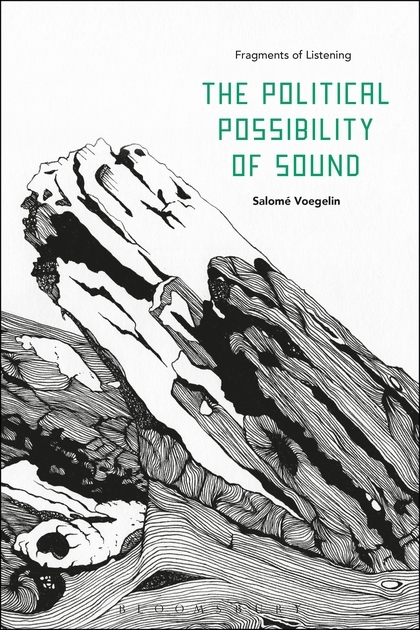 The themes of these essays emerge from and deepen discussions started in Voegelin’s previous books, Listening to Noise and Silence and Sonic Possible Worlds. Continuing the methodological juxtaposition of phenomenology and logic and writing from close sonic encounters each represents a fragment of listening to a variety of sound works, to music, the acoustic environment and to poetry, to hear their possibilities and develop words for what appears impossible. As fragments of writing they respond to ideas on geography and migration, bring into play formless subjectivities and trans-objective identities, and practice collectivity and a sonic cosmopolitanism through the hearing of shared volumes. They involve the unheard and the in-between to contribute to current discussions on new materialism, and perform vertical readings to reach the depth of sound. Including a performance by David Mollin and Salomé Voegelin about the precarious lives of hummingbirds, the need for leadership and the sound proofing qualities of ceiling tiles to ensure privacy and the right to speak. David Mollin and Salomé Voegelin are a Swiss-UK artist collective (Mollin+Voegelin) who have been collaborating since 2008 on projects that focus on invisible connections, transient behaviour and unseen rituals. Their work reconsiders socio-political, architectural and aesthetic actualities through the possibilities of sounds, voices and words, whose invisible mobility invites an individual and collective inhabiting and promotes participation. According to the American police radio scanner codes, number ‘03’ is an instruction code to switch on lights and sirens in police vehicles. Through the audio/visual performance, the piece implicitly scopes the ecology of fear within political ruptures and riots. Using the sonic qualities of police sirens, generated numbers, red/blue police colours, audio and visual noises. The performance aims to bring the audience to a state of attentive and expanded listening to ‘alert’ and ‘alarm’. Khaled Kaddal (b.1987) is an artist and musician, raised in Alexandria, Egypt. His broad body of work encompasses cross-disciplinary approach, integrating different mediums including sound, sculpture and moving images for performances and installations. His research-led work often adopt contemporary socio-political aesthetic with the intention to explore the sensory memory (iconic memory and echoic memory) of the human body. ​​Performed and exhibited globally including Sharjah Art Foundation (UAE), Valletta European Capital of Culture 2018 (MT), Palazzo Mora Venice Bien­nale 2018 (IT), Mosaic Rooms Gallery (UK), Dilston Grove Gallery (UK), Townhouse Gallery (EG), Spektrum (DE), Nour Festival (UK), Generate Festival (DE), AltoFest (IT), D-CAF Festival (EG). Presentations at Aarhus University Denmark (DK), IREMAM (FR) and Westminster University (UK). He has awarded grants from Mophradat, the Sharjah Art Foundation, Arab Fund for Art and Culture (AFAC) and British Council. He pursued his master’s degree in Sound Art at the London College of Communication, UAL (2016). As part of the Social Acoustics series, moderated by Brandon LaBelle. This talk will explore biosensing musical interfaces (such as the BioMuse, developed by Knapp and Lusted 1988; and Xth Sense wearable biophysical technology, developed by Marco Donnarumma 2010-2014) together with histories of electrotactile and vibrotactile communication, speech recognition and synthesis, and voice and touch-driven digital interfaces. Biosensing musical interfaces are interactive and kinetic systems. They comprise sensors that detect performer’s physical gestures and bioelectrical signals, hardware, and software, which amplifies, filters, and digitizes the signals and translates them into audio. With this procedure, biosensing musical interfaces do not simply analyze, control or amplify but they also interactively shape bodily gestures, signals and sounds. The interface here can be considered the mediation of the signals, a process one that is both physical and abstract. Tracing the seminal works — Music for Solo Performer (Alvin Lucier, 1965), Spacecraft (Musica Elettronica Viva, 1967), and Ecology of the Skin (David Rosenboom, 1970) — composers, performers and music technologists engaged in biosensor and gesture-based interactive performances — such as Atau Tanaka, Biomuse Trio (Ben Knapp, Eric Lyon, Gascia Ouzounian), Laetitia Sonami, Miguel Ortiz, Marco Donnarumma, Baptiste Caramiaux, Rebecca Fiebrink, Frédéric Bevilacqua, Pavlos Antoniadis, Tod Machover, Teresa Marrin-Nakra, Rosalind Picard and Jaime Oliver La Rosa— have examined biosensing musical interfaces drawing on human-computer interaction, digital musical instruments, expressive capacity of embodied gesture, quantitative and qualitative analysis of emotion, notation, affective computing, as well as algorithmic listening, new forms of interactive and collaborative music making, co-agency of machine and human learning, and music, health and wellbeing. Following this lineage, I wish to look at biosensing musical interfaces in a both related and different way. First, referring to histories of electrotactile and vibrotactile communication and speech recognition and synthesis, I will suggest that biosensing musical interfaces are both touch-driven and voice and speech-driven technologies. Building on this suggestion and examples of biosensor performances, I will consider voice and touch-driven technologies intertwined. Second and last, I will discuss the convergences and divergences between contemporary communication and speech technologies developed for deaf and hard of hearing people (such as the signing gloves that translate sign language into text or/and automated speech) and biosensing technologies developed for gesture-based interactive performances. Despite their different contexts and applications, these two technologies demonstrate some technical similarities in their foundations. However, they have different protocols and implications. The former is invested in so-called “efficient and functional” communication. The latter does not necessarily attempt to transmit or signify a verbal message in particular. It explores expressivity at the core of intentional variation and control of gesture. But what the gesture and the corresponding sound express remains uncertain, interruptive, and evocative. Looking at the speech and biosensing technologies together, I wish to suggest that the expressivity in biosensor performances prompts a different case of tactile speech and voice, one that is not limited to verbal language, human body or vocal cords. Tactile Speech is a project that Bulut currently develops at the Max Planck Research Group “Epistemes of Modern Acoustics,” led by Prof. Dr. Viktoria Tkaczyk at the Max Planck Institute for the History of Science. The study is part of Bulut’s first monograph, Building a Voice: Sound, Surface, Skin. Our plant think­ing becomes plant speak­ing. From ven­er­a­ble ancient trees to exper­i­men­tal com­post and cloned bananas, this pro­gram voices plants in whose pos­si­ble pasts and futures we, as humans, are both cen­tral and oddly dis­placed. This pro­gram fea­tures two new per­for­mances com­mis­sioned by Liquid Archi­tec­ture, plus a spe­cial per­for­mance by Plants and Ani­malia (CES and Felic­ity Mangan). Makiko Yamamoto presents Banana, Tree, Stool, a new suite of lan­guage poems about the pos­si­ble mes­sages fruits and veg­eta­bles from our past, present and future may have to convey. 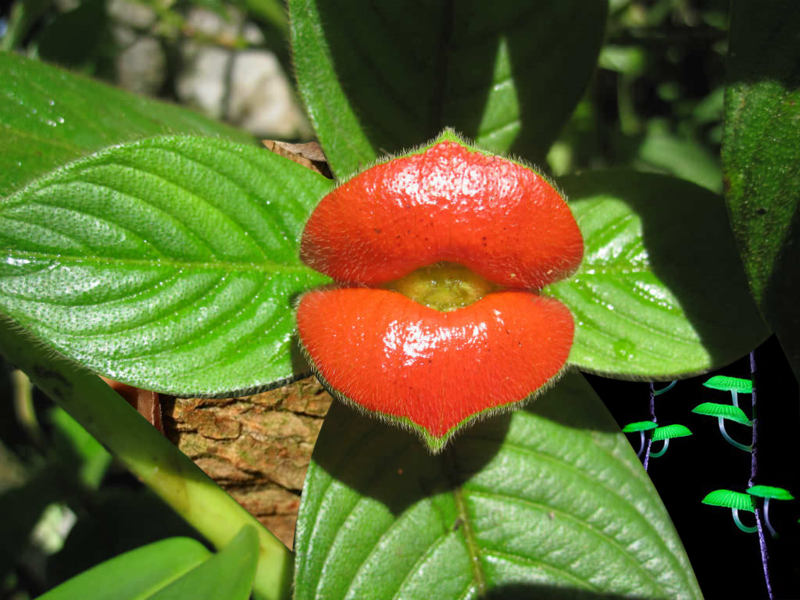 CES vs Plants and Ani­mals will gen­er­ate a finely tuned quasi-bioa­coustic envi­ron­ment in which bio­chem­i­cal soni­fi­ca­tion of actual plant chem­istry, animal and syn­the­sised sounds oscil­late and sync in bio­phonic arrays. Nathan Gray presents The Sta­tion, a sci­ence-fic­tional lec­ture-per­for­mance regard­ing humanity’s vio­lence towards the nat­ural world and in which one of the three nar­ra­tors is a tree.